The grocery store by us, Wegmans, had a lobster fest event a few Saturdays ago. I never cooked a lobster but was feeling ready for the challenge. Hubby has been to a few of the New England states this year for work and fun and he sent me pics of lobster rolls he was eating. I am highly suggestible and they have been haunting me for months. So when I saw the lobsters all lined up at the store, I had to bring a few home to try to capture the delicious taste of new england lobster rolls at home. 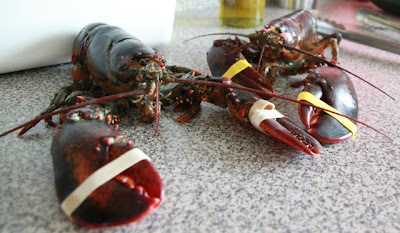 I washed them, steamed them, cleaned them, chopped them into large chunks and then made some lobster rolls. It was so worth the hard work. They were amazing!! Mix mayo, lemon, a pinch of salt and pepper, a few dashes of hot sauce, chives and basil. Pour over lobster and toss to coat. Spread butter on the outsides of the New England style hot dog rolls and toast on a medium heat pan until golden brown. 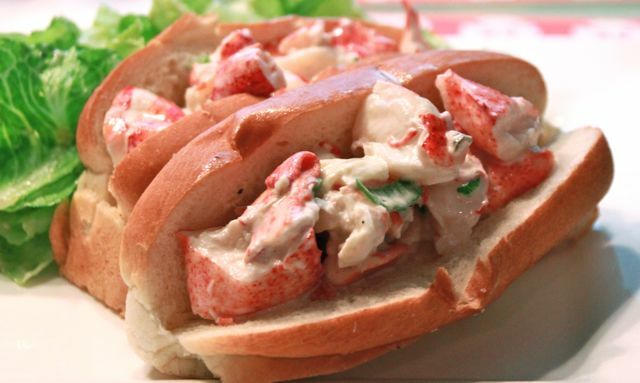 Each lobster should make 2 rolls for 1 person. Divide the meat evenly onto the toasted rolls. We served it with a salad and chips. i love the how to cook everything book!! i'm a little nervous to cook lobster myself, but they sound so yummy. Just wanted to let you know your recipe was featured on this week's What's Cooking Wednesday!